Prior to his recent successful rally in Lahore that drew at least 100,000 people, Imran Khan’s energized young supporters employed social media to spread his message, and the participants and observers offered play-by-play accounts of the rally on Twitter. This is a first in Pakistan's political history for a serious contender for high office. With near 265,000 Facebook fans, Imran Khan is only surpassed by former President Pervez Musharraf's 433,000 fans. None of the other politicians come close. Half the population of Pakistan is below 20 years and 60 per cent is below 30 years. With this youthful population and rapidly expanding Internet access, the use of social media is growing in the country. Over 5,000,000 people in Pakistan use Facebook. Although this only targets about 3% of the population, this translates into more than a quarter of the Internet users in Pakistan having a Facebook account. Half of them are between the ages of 18-24, and an additional quarter are between ages 25-34. It appears that Pakistan's political campaigns are entering a new and exciting phase. 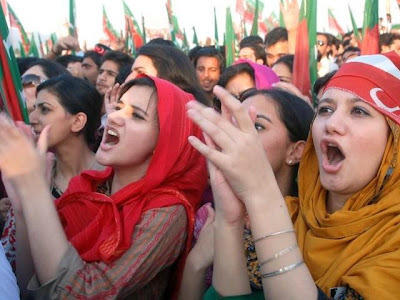 The youth no longer feel stifled by the heavily censored state electronic media which dominated the national landscape for most of Pakistan's existence, nor are they intimidated by the old and powerful politicians. In fact, the new talent does not rely even on the corporate-owned commercial media that have emerged and become powerful during the last decade of President Musharraf's rule. With the growth of Internet in Pakistan, the rapidly expanding online population is feeling more empowered than ever to engage in free expression as part of their growing political and social activism. With expanding educational opportunities, rising middle class and growing access and use of the modern social media by the nation's youth, Pakistan is now in the midst of a dramatic social and political transformation that is likely to change the face of politics in the coming decades. The arrival of this new era has the potential to eventually end the old feudal style politics of patronage, and replace it with a truly participatory democracy and vastly improved governance. If Imran Khan was able to only get 100,000, it was a failure, which the military is trying to portray as a success, since the ISI is trying to build pressure on both PPP and PML-N to release its pressure on the army. PML-N recently rejected the DHA bill in the national assembly, and so did some other parties. Imran Khan may also get support from ANP, which could give him an entry into Karachi. ..."As I stood there, watching them, I knew the moment had come," Khan, who is the leader of the Pakistan Tehrik-e-Insafr party, said. "Now nothing can stop us. This is a revolution, a tsunami. We will not just win the next elections – we will sweep them." 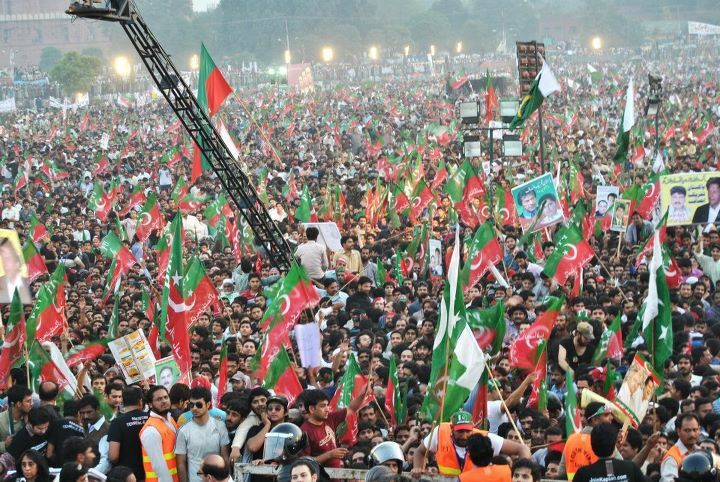 Over 100,000 people crammed into a historic Lahore park. Many were middle-class Pakistanis – young, urban, educated – drawn by Khan's rhetoric and their anger at conventional politics. "This is the emergence of a new force. The cry for change is resonating across Pakistan," said Ayaz Amir, a parliamentarian from rival Nawaz Sharif's party, who was there. "Young, old, professionals, women – I've never seen such people at a public meeting in Pakistan before." The sight, Amir added, had "scared the living daylights" out of his own party. But others are sceptical that Khan represents real change. "We've heard this rhetoric many times before," said Badar Alam, editor of Herald magazine. "I'm cautious about it. I don't know what agenda he is really promoting." Khan is visibly buoyant. For years he has campaigned on a platform of what some call "anti-politics" – virulent criticism of the graft and patronage that infect Pakistani politics. Now, he says, he has been proved right. His plan for the economy is to "inspire" Pakistanis to pay tax – currently only 2% do so. "We just need to have some austerity and collect taxes. If we do that, we can balance our budgets," he said. In power, Khan said, he would cut off American aid. "I want to be a friend of the Americans, not their lackey. Aid is a curse for a poor country; it stops you making the required reforms and props up crooks." "Anyone who thinks this country will be taken over by Taliban are fools. There's no concept of a theocracy anywhere in the Muslim world for the past 1,400 years. If I came to power, I could end this conflict in 90 days – guaranteed." Yet Khan is defiantly proud that his newfound success is vindication against what he calls the "liberal, westernised elite" – wealthy, English-speaking Pakistanis who, he claims, are out of touch with the realities of their own country. "I call them coconuts: brown on the outside, white on the inside, looking at Pakistan through a westernised lens," he says. His political views are firmly rooted in a particular view of Islam. He does not favour changes to the notorious blasphemy law – a virulent debate that led to the assassination of his friend Salmaan Taseer last January. "The time is not right. There would be bloodshed. We need to worry about other things," he says. But the main opposition challenger, Nawaz Sharif, has failed to capitalize on this misfortune. His N-league party, which controls the Punjab government, has grown unpopular for failing to contain an outbreak of dengue fever in recent months. Sharif is also estranged from the powerful military, which launched him into politics in the 1980s, due to his long-standing rivalry with Pervez Musharraf, the general who ousted Sharif from power in 1999. Imran says will end conflict in 90 days i am ready to give him 90 weeks but if nothing happens then we'll back the old parties. I am going to vote for change just this one time. Population density is high in the Bhati Gate and lower Mall area where PML-N held their rally....so the nmbers in PML rally could be just because of that. But Minar-e-Pakistan has big open spaces, wide roads all around and separated from the Walled City by big spaces of Lahore Fort and Badshahi Mosque, so difficult to fill up. Imran's rally was certainly strong in terms of public participation. I was in Islamabad last week and every single person I talked to has become an Imran follower. Same is the case with every Lahori I've talked to; previously the same or similar Lahoris were all for PML-N. It seems that the sheep phenomenon has set in Central and Northern Punjab, and the public (sheep) of these areas are all for Imran now. Pakhtoon areas of KP are reputed to be already supportive of Imran much ahead of his show in Punjab. So in the next elections, Imran's party (TI) will probably win a lot of seats in KP, Central and Northern Punjab. The main losers will be PML-N, PML-Q and ANP who presently claim a lot of public support in these areas. PPP may try to separate Southern Punjab into the new Seraiki province where it may still get to a position of strength through traditional landlord politicians. MQM remains unaffected; its rally in Karachi was certainly very impressive and demonstrates that Mohajir public (sheep) are still with MQM. The Sindh/ Karachi situation may experience a greater polarization with PPP becoming more Sindhi nationalist, ANP focusing even more on Karachi Pakhtoons if they lose out to TI in KP, and MQM getting limited to Mohajirs rather than expanding out to other groups as they've been trying to do. If Army/ISI do play a role, then TI and MQM would likely be on the same side after the elections. Suhail:"But Minar-e-Pakistan has big open spaces, wide roads all around and separated from the Walled City by big spaces of Lahore Fort and Badshahi Mosque, so difficult to fill up. Imran's rally was certainly strong in terms of public participation." Imran's rally did not appear to be a rent-a-crowd brought together by paying public money looted from the govt treasury by the local party bosses and landowners....a technique used by the PPP and the PML. It was made up of mostly urban middle class youth tired of the PML and PPP incompetence and corruption. Regardless of how you put it, if Imran is as popular as Suhail claims he is, a crowd of 100,000 in Lahore is still less than what would get together if one were to climb up an electrical pole and starting banging it with a stick. I am not convinced Imran is a threat to PML-N, unless ISI funds him or if he is funded by a third country. Imran Khan alone cannot do anything. There are people in the TEI who take bribes as well given to them by military businesses. The military will decide who wins in the end. Imran has lots of plans for the people of Pakistan but will have to stand trial before the other parties and media before the elections for his casanova past. Pakistanis have a sheep mentality. You offer them the best in the world and they'll not even listen to you. But if somehow you get to a position where you have the sheep following, then you give them crap and they'll happily take it. To your comment on Lahore crowd: If you want to hold a public meeting, despite the big population, you'll not be able to get 100 people to listen to you for one hour unless you rent their time. This will hold true for both Lahore and Karachi. Imran's position was similar previously. Though he kept on selling the same ideas, he could not get to attract the sheep (crowds) and thus considered a non-serious contender. The Lahore rally has changed the perception and now the sheep phenomenon seems to have set in. In the coming days, his following will keep on fast increasing with more and more sheep joining him. The last sheep following was for Bhutto in the 60s and then on a limited scale for Altaf Husain in the 80s. Nawaz has always conducted his politics by dispensation of money, renting people's support. He never had the sheep following though still has the obsession of being a big public leader. Don't forget that he got into the politics business with big money most likely given to him by Osama in early 90s. A point to note is that Imran's core following is of the educated upper middle classes. PPP's bulk following is the poor and uneducated rural populace of Sindh while MQM's core followers are the half-educated Mohajir lower middle classes. The well educated Mohajir upper middle classes have had little to do with MQM and are not welcomed to MQM either. What you call "sheep following" is called "momentum" in America. It is "momentum" that helps attract funds to the campaign of a candidate who is seen as a winning horse by people and corporations betting with with their money to help their own agendas. Riazbhai, how do you see Imran dealing with the threats to Pakistan. Pakistanii Taliban, USA, and India. He has stayed quiiet on those issues. Will he do what the military wants regarding foreign policy or will he chart a new path? Umar: "Will he do what the military wants regarding foreign policy or will he chart a new path?" From what little I know about the man, I think Imran Khan is no one's puppet. He's his own man and will do what he thinks is right, whether you or I or anyone else agrees with him or not. Founder and Leader of Muttahida Quami Movement (MQM) Mr Altaf Hussain has congratulated Chairman Pakistan Tehreek-i-Insaf (PTI) Imran Khan and other leaders and workers of his party on their successful public meeting in Lahore. Mr Hussain said that the PTI public meeting was the breath of fresh air in the political atmosphere of Pakistan. He said this while talking on telephone to the office-bearers and workers of the MQM in the Punjab House. The MQM workers requested Mr Hussain to hold a public meeting in Lahore. Mr Hussain said that a date for the public meeting would be announced after discussing the suggestion with the Co-ordination Committee. Riazbhai, you have probably mentioned this before but politicians are a "SPOILED" bunch. Imran is a fresh apple among a large basket of rotten ones and ultimately he will become rotten too. Too many times Pakistanis have been promised the world only to have their hopes dashed later. I like the guy but isn't it too early to tell?? Another point of note is Shams's reference to ISI support. Army/ISI are bigger stakeholders in Pakistan than the political parties so usually play a role in the elections; 2008 elections were an exception and we've seen the disastrous results. They are thoroughly disgusted with the way the country is being managed and has been managed in the past by Nawaz Sharif and Benazir/Zardari, so should be a natural supporter of Imran. A negative for Imran can be the US if they are in opposition to Imran and decide to pressurize Army/ISI to keep Imran out and let Zardari continue. Given the highly irrational decision making of the US that we've seen over the years, this possibility remains. Suhail: "They are thoroughly disgusted with the way the country is being managed and has been managed in the past by Nawaz Sharif and Benazir/Zardari, so should be a natural supporter of Imran." The Army and the ISI know that sound economic policy is an essential part of sound national security policy. You're not allowing more than 100,000 heads of sheep in Imran's rally, though the estimate in the map below indicates it can be 400,000 plus. 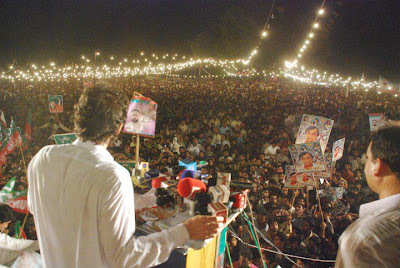 I think you should not be discriminatory against Imran and allow for a figure far greater than 100,000. Comparison with MQM sheepheads is immaterial because the two are different flocks, Punjabi and Mohajir sheep. Even if it sweeps Karachi MQM will only land up with 25 seats in NA, but if Imran is successful in Punjab, he'll end up with 100+ seats and in a position to form a government. Najam: "I also do not like him much,particularly his arrogant manners and day dreaming ,and also the type of people joining his party." The biggest problem Pakistanis have is their expectations of “Perfection” from some leaders. If they are not perfect then Zardari, Nawaz Sharif, Altaf Hussain or even the Devil will be okay. Imran Khan is one of the few leaders who can provide some hope of better governance for Pakistan in the near future. If he gets elected with majority he will be much better than what we have today. At least he is NOT corrupt or a shoe-licker of USA. Unless you can suggest some other good (not perfect) leader to be elected please support the only fair chance Pakistan has for the next election and stop undermining him by looking for perfection. Haseeb: "The biggest problem Pakistanis have is their expectations of “Perfection” from some leaders." I agree with Riaz's assessment. At this time it is a rarity for some one to be "clean" specially in Pakistan. Lets look at it this way, if IK's party loses, conditions in Pakistan may become worse but not better. If it wins there is some hope that things may change for the better. I say we are due for a change and want to see a new party in power with a new agenda. Lets give it a shot. .....the diaspora found much cause for celebration in last week’s announcement by the Election Commission of Pakistan (E.C.P.) that 3.7 million Pakistani expatriates will be allowed to vote in the next general elections, scheduled for spring 2013. But back in Pakistan, the E.C.P.’s announcement has sparked the latest round of political mudslinging. The idea of granting Pakistani expats voting rights only gained traction when the political upstart Khan petitioned for it in the Supreme Court. His political opponents claim that Khan stands to gain most from the change since his Pakistan Tehreek-e-Insaf (P.T.I.) party enjoys widespread support in the diaspora. Some analysts and pro-government activists also say it undermines President Zardari’s ruling Pakistan Peoples Party, which has recently clashed with the court over corruption cases against the president, leading to contempt-of-court charges against the prime minister. It is unlikely that any nefarious politics motivated the ECP’s announcement. For once, the matter boils down to simple economics. Remittances from expatriate Pakistanis are the backbone of Pakistan’s economy. The inflows ease the country’s current account deficit and boost its foreign exchange reserves. In 2010, remittances accounted for more than 5 percent of the country’s G.D.P. Between July and December last year, overseas Pakistanis sent back $6.3 billion, almost 20 percent more over the same period the year before. The World Bank ranks Pakistan among the top ten recipients of remittances. In the long run, though, these new voting rights may also prove to be a test of allegiance. The E.C.P. has ruled that Pakistanis holding dual citizenship are not eligible to vote. Will Pakistani expats put off applying for a second nationality in order to retain their right to vote back home? A political novice, Ghani came to the campaign from Chicago-based R&D firm Accenture Technology Labs, where he specialized in building algorithms from various data sets—like consumer shopping habits—to help businesses improve their bottom lines. In one of his more recent projects, Ghani developed a model to estimate, with 96 percent accuracy, the end price of an eBay auction—information that could then be used to sell price insurance to queasy users worried about coming up short. At OFA, his skills have been put to use on Project Dreamcatcher, which uses text analytics to gauge voter sentiment. That eventually led him to Carnegie Mellon University in Pittsburgh for graduate school where he studied Machine Learning and Data Mining. It was during this period that he started working at Accenture Technology labs as chief scientist, before joining Obama For America. At Accenture, Ghani mined mountains of private data of given corporations to find statistical patterns that could forecast consumer behavior. In today’s data-centric world, the one-size-fits-all model is no longer an efficient use of a company’s resources. More and more, corporations are looking for increasingly targeted approaches to attract consumers. During a recent interview, Obama for America Chief Scientist Rayid Ghani compared his team’s social media approach in 2012 to the shift in web content from reposted print material to material designed for the web. For many organizations, he said, the prevailing strategy is “‘I used to use email, and now I’m just going to put the same information on a Facebook page.’” However, the president’s campaign used an abundance of online and offline data in order to hyper-personalize messages and get the most bang for its buck in terms of outreach. Essentially, Ghani explained, the campaign was able to match up supporters’ friends against voting lists and determine how it should approach supporters to reach their friends. If someone was going to spread a message to 20 people, the campaign wanted to ensure they reached 20 people most likely to take action in some way. Because Ghani’s team had done so much work integrating its myriad data sets into a single view, it was better able to decide who could be most easily persuaded to vote for the first time, to donate money, to get active knocking on doors or perhaps even to switch sides.